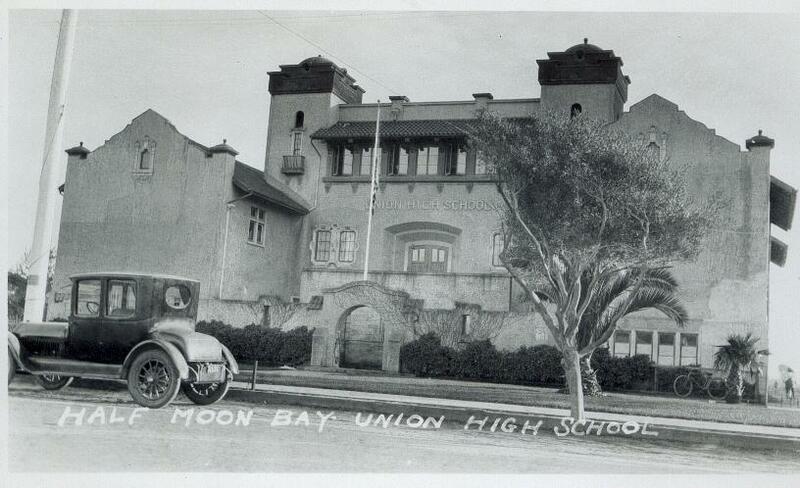 Photo, at right: The preliminary hearing for Vorhes Newton was held at the old Half Moon Bay High School. There was so much interest in the 1946 âBabes in the Woodsâ? case that the arraignment of the 24-year-old âconfessedâ? murderer Vorhes Newton had to be moved from Half Moon Bay Judge Bettencourtâs intimate courtroom to the much larger school gymnasium. The schoolâs gym could accommodate the 65 officials, attorneys, family members, press and news photographers gathered for the brief proceedings. Children were kept out but you could see their curious little faces pressed against the windows of the building. A dozen members of the defendantâs family sat behind Vorhes, whose hunched shoulders gave him a fragile bearing. The black eye he sustained in an accidental fall at Lake Tahoe, where he was apprehended, was now turning a sickly green and yellow. When he turned to look at his mother, she pressed her sonâs hand meaningfully, her eyes brimming with tears. Vorhes Newton was accused of brutally murdering his two daughters, more babies, than children. He was also accused of attempting to murder his wife, and the mother of his children. To record the seriousness of the moment, photographers, six of them, moved adroitly about the room, the searing white light from their flash bulbs creating a photographic memory in the newspapers. Vorhes Newtonâs brief appearance at the first legal proceeding consisted of a few questions and then it was over and sheriffâs deputies drove the defendant back to the county jail at Redwood City. A few days later Newton attended a more significant legal event, the inquest into the death of his two small girls discovered in a remote part of Montara on the San Mateo County Coastside. Their traumatized mother, Lorraine, survived the vicious attack but was still recovering from serious injuries in a Half Moon Bay hospital. Sheriffâs deputies escorted their prisoner, attired in tan slacks and a jacket, his black eye completely healed, from the jail to a nearby mortuary chapel where a jury convened to hear testimonyâwhich turned out to be more grisly details of the killings. Witness Jimmie Fideler, a Montara rancher, testified that he saw Vorhesâs wife. âShe had a black eye and was staggering. She had blood over her blouse,â? Fideler said, âand appeared to have been badly beaten. She told me she had been wandering all night on the road.â? Fideler said that well known Coastsider John Kyne was with him. Kyne told the jury, âAll of us knew about the car going up the road the afternoon before, with a woman screaming, so we were on the alert that morning.â? Kyne was talking about the car driven by Vorhes Newton, with his wife and children as passengers. Upon advice of counsel, Newton himself refused to testify. The support he had from his family was evident again: when he returned to the jail he was accompanied by his sister and her husband, the same sister he had borrowed the car from for the tragic ride from the East Bay to the Coastside. Following the testimony, the coronerâs jury– three men and three women, described as housewives–found that Barbara Ann Newton, 23 months old and Caroline Lee Newton, seven months, âcame to their death from skull fractures caused by blows with a blunt instrument wielded by person or persons unknown.â? They recommended further investigation by the district attorney. Lorraine Newton was recovering from a skull fracture at Community Hospital in Half Moon Bay and did not attend any of the early proceedings. It was said that she didnât know what had happened to her children. Her parents, the Frank Tuttles of North Hollywood, wanted to be the ones to break the horrific news to their daughter. But Dr. Raycroft, the head of the hospital, convinced them it was his role to his patient âat the proper timeâ?. That meant without the authorities presentâand he would not allow Lorraine to see her husband. Two weeks after her children had been murdered, and during the preliminary hearing in Half Moon Bay, Lorraine Newton, still hospitalized, spoke publicly, âtestifiyingâ? for the first time. Besides her parents, County Investigator Frank Marlowe, Deputy Sheriff Jack OâBrien stood at her bedside as Stenographer Virginia Knight recorded the emotionally charged evidence. It was almost unbearable to hear Lorraine speak, her voice breaking frequently, moving forward through heavy sobbing only haltingly. She said she woke up battered and bleedingwith daughter Barbara dead in her arms. While stumbling she fell into a creek, and wet and shivering, she found an abandoned chicken shed before losing consciousness. Then Lorraine Newton cried so hard that the testimony had to be stopped so she could regain her âcomposureâ?.. She denied seeking an abortion but said she intended to visit a doctor in San Francisco. What the purpose of that medical visit was we donât know. Again she recalled part of the fatal automobile ride, watching the waves at Rockaway Beach in Pacifica– and then remembering nothing until she woke up with her dead child in her arms. Lorraine recalled that she and Vorhes didnât argue but that he was moody at Rockaway Beach. âWhen I last saw him,â? she said, â he was sitting in the car. Then I remember nothing until I woke up lying over my babyâs body.â? Meanwhile, at the preliminary hearing held at Half Moon Bay High School, Assistant District Attorney Fred Wycoff questioned a dozen witnesses, establishing the facts of death, the murder ride, the discovery of Mrs. Newton and the children, the capture of Vorhes at Lake Tahoe and the finding of his wifeâs rings in his pockets. Wycoff produced a witness, a Mexican farm worker, who testified seeing the man who drive into the canyon at Montara with a woman, and later emerge without her. âInsufficient evidence,â? countered the famous defense attorney Leo Friedman, moving for dismissal. There was the obligatory moment of silence– and then Judge Manuel Bettencourt ruled that Vorhes Newton be bound over for trial. Outside the courtroom, Newtonâs attorney Leo Friedman courted reporters, verifying that Newtonâs neighbors said Lorraine was the quarrelsome half of the couple. He said that John Kyne discovered Lorraineâs rings were gone. When found, she was wearing a glove and Kyne helped her remove it to reveal the missing rings. Could that mean Vorhes Newton ripped the glove off his wifeâs hand and took the rings, âDid he put her gloves back on her?â? Friedman asked reporters. Six months passed before the trial would begin. Next PostNext At Moss Beach Old Rocks Don’t Crumble….